Simms ColdWeather long sleeve shirt now a all time favorite for fall and spring fly fishers. The ColdWeather shirt features wicking UPF50 protection, two large fly box compatible chest pockets with a hook loop design, off shoulder seaming for both comfort and articulation. 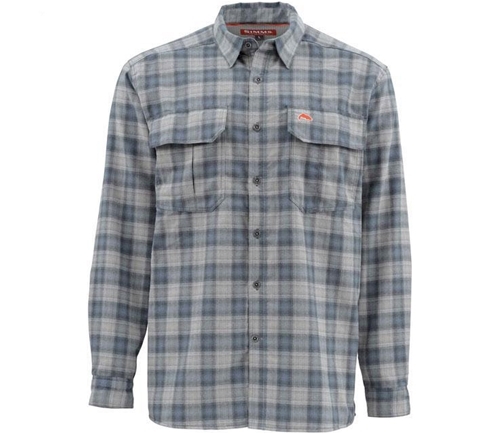 The Simms cold weather shirt comes as a traditional slim fit with a slight drop tail. Also a great piece to wear off river into town or even working in the yard. There are three kinds of heat transfer: conduction (exchange of heat through contact), convection (movement of air), and radiation. setting up a layer of still air which serves as insulation, by the use of fibres (wool, fur, et cetera). Another important factor in ColdWeather insulation is humidity. Water is a good conductor of heat, thus if clothes are damp — because of sweat, rain, or immersion — water replaces some or all of the air between the fibres of the clothing, causing heat loss through conduction and/or evaporation. and between the two, a "thick" layer that traps the air and prevents contact between the skin and the wind-breaking layer (which, as it is thin, gets close to the ambient temperature). The three layers of air between the skin and the exterior layer also play an insulating role. If the clothing is squeezed tight (as by the straps of a backpack), insulation will be poorer in those places. Clothing coldweather insulation may be expressed in clo units. The clo has the same units as the R value used to describe insulation used in residential and commercial construction. The clo value is also similar in magnitude to the R value. This is the amount of insulation that allows a person at rest to maintain thermal equilibrium in an environment at 21°C (70°F) in a normally ventilated room (0.1 m/s air movement). Above this temperature the person so dressed will sweat, whereas below this temperature the person will feel cold. There are a number of ways to determine clothing coldweather insulation provided by clothes, but the most accurate according to ASHRAE Fundamentals are measurements on heated manikins and on active subjects. Equations may then be used to calculate the thermal insulation. Because clothing insulation cannot be measured for most routine engineering applications, tables of measured values for various clothing ensembles can be used. According to ASHRAE-55 2010 standard, there are three methods for estimating clothing insulation using the tables provided. It is possible to define a complete clothing ensemble as a combination of individual garnments using Table 2. The word "togs" is a British slang term for clothes.